Bridge II Sports Founder and Executive Director Ashley Thomas is being recognized by Cary Magazine in their September 2018 issue as one of 5 Women of Western Wake making an impact in their communities. This honor reflects her dedication to creating opportunities for people with phsyical disabilities through Bridge II Sports and specifically her 5 year effort and determination to bring together corporate, community and municipal groups in creation of an accessible kayak launch/dock in Wake County at Lake Crabtree County Park in Morrisville, NC. On October 26th Ms. Thomas will join the other 4 honorees at the Women of Western Wake Luncheon and Forum at the Umpstead Hotel & Spa in celebration of their achievements. Tickets are available to this event. Don’t ever tell Ashley Thomas that she can’t do something. Thomas, 56, is a tireless advocate for people with disabilities, fighting expectations that physical limitations somehow diminish a person’s worth. The nonprofit she founded, Bridge II Sports, promotes wheelchair basketball and other adaptive sports in the Triangle. Through the nonprofit, athletes of all abilities can discover the joy of competition and physical exercise. “Everyone has value. Everyone who is born on this earth has value, whether you have a disability or not,” she said. Thomas was born with spina bifida and uses a wheelchair. She is also an accomplished athlete. In her 40s, Thomas participated in her first 5K and started working with a trainer at the YMCA. Exercise gave her something she had been missing all her life, she says, helping her feel better physically and mentally. Around the same time, Thomas was volunteering at the Duke Children’s Hospital and the spina bifida clinic. She met families whose children had a variety of disabilities and scant hope for the future, she says. “I had such joy in it. I thought kids need to have this. Boy, if I’d had this when I was a kid, how great would that have been,” she said, talking about adaptive sports. She decided to change that, launching Bridge II Sports in 2007. Working with area parks and recreation departments, the nonprofit creates programming and brings in the specialized equipment needed to field teams. Some of the sports offered include wheelchair basketball in Raleigh, archery in Durham and bocce ball in Cary. Ashley Thomas, who competed on the U.S. Paralympic kayaking team, lowers her craft to the water at Lake Crabtree. She worked with engineering students at Duke University and UNC-Chapel Hill to modify her chair so it could tow the kayak, enabling her to get on the water without help. BIIS also coordinates the Valor Games Southeast, a three-day competition for injured veterans, in partnership with the Department of Veterans Affairs. The 2018 event drew 115 participants who competed in 11 adaptive sports throughout the Triangle. The group also partnered with Wake County to create a wheelchair-accessible kayak launch at Lake Crabtree County Park in Morrisville. Thomas calls the project one of her proudest accomplishments. In 2009, Thomas was introduced to kayaking at a sports conference, and soon after, she was invited to train for the U.S. Paralympic kayak team. “I’m competitive, but never had the ability because I didn’t know about adaptive sports growing up. It was an honor at my age to be able to (compete),” she said. As a competitive athlete, Thomas needed somewhere to train. The obvious choice was the calm water at Lake Crabtree, where motorized watercraft are prohibited, but getting from her wheelchair to her kayak was a challenge. The park needed accessible facilities and a new dock. “In the world of disability, a lot of people demand and feel entitled, but my approach has always been if I need something, I’m going to come to the table as an active player,” she said. Thomas and a group of fellow kayakers attended monthly meetings for nearly five years. They consulted with engineers and designers on modifications that would make the dock the most accessible in the country. She convinced officials at MetLife and Duke Energy to provide funding for the dock and other specialized equipment. And at one point in the process, when negotiations stalled over bathroom facilities, Thomas filed a complaint with the Department of Justice under the Americans with Disabilities Act. 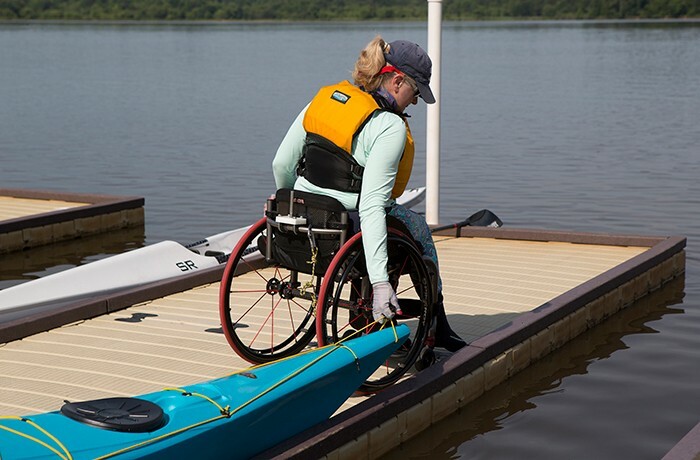 The dock opened in 2016 and now allows people with disabilities to station a canoe or other watercraft securely as they move from the dock into the boat. Although she doesn’t race anymore, Thomas regularly visits Lake Crabtree with her kayak. She appreciates everyone who worked with her and her team over the years, but those who know her attribute her success to her energy and personal charisma. “There’s just some effect that her presence has,” said Brad Rosell, the marketing manager for BIIS. Thomas learned early on that she had to speak up for herself, to take charge of her health and to ask for help when she needed it. She says she is fortunate because some people with disabilities don’t know how to ask for help. Through adaptive sports, Thomas aims to give players the confidence to find solutions to their everyday challenges. And through her advocacy, she wants to help the community think of people with disabilities differently. Click here to read the complete article highlighting all 5 Women of Western Wake.